The database at Pro Football Focus has few limits, and we’re able to dig into specific traits and facets of the game using our years of data sets. Here, we dive into some of those traits and tell you who the best players are in a variety of categories, from the most efficient tackler in the league to the best quarterback throwing a go route. It’s our list of the NFL’s best performer in every category you can think of — for the third year in a row — using our stats and data from the season. And just because we can, we added more categories this year, identifying 60 elite performers in specific skills. At 95.0, Brees tops the board. He leads the league with his 84.8 adjusted completion percentage (adjusting for drops, spiked balls, throwaways, passes on which the QB was hit as he threw and batted balls at the line of scrimmage). He is completing passes at a high rate and still averages 8.6 yards per attempt, living comfortably above the “game manager” label. From inside the pocket, Brees has completed 79.8 percent of his passes to lead the league and has connected on 19 touchdowns against one interception. The future Hall of Famer’s 85.1 percent adjusted completion is the best in the league from inside the pocket. 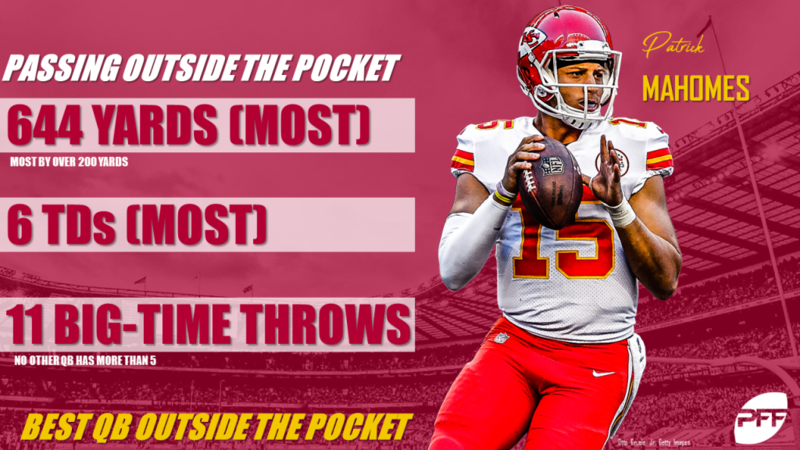 Mahomes leads the league with six touchdown passes, 644 yards (no other QB is within 200 yards of him) and 11 big-time throws (PFF’s highest-graded throws, and no other QB has more than five) from outside the pocket, proving to be an unstoppable force outside of the structure. Currently leading the league in both tight-window throw accuracy (48 percent) and overall accurate passes (68 percent), Brees is in a class of his own with his accuracy. Wilson leads the league with nine big-time throws in the red zone, three more than the next quarterback. His 15 touchdowns inside the opponent’s 20-yard line are good for fifth best, and he’s avoiding taking sacks in scoring range, having gone down just once on his 36 red zone dropbacks. When the defense sends extra rushers, Wilson leads the NFL with his 8-0 touchdown-to-interception ratio. He has a 129.4 passer rating and has uncorked 10 big-time throws against the blitz to lead the league. 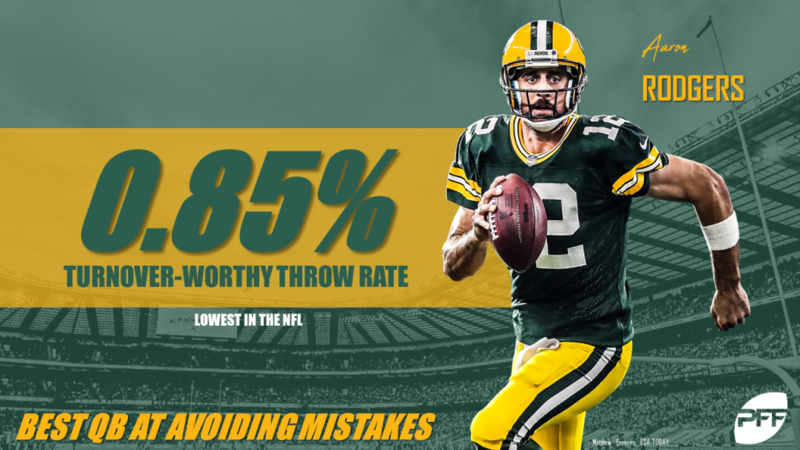 On a throw-for-throw basis, no qualified starting quarterback has thrown fewer turnover-worthy passes than Rodgers, as he limits those turnover-worthy throws to just 0.85 percent of his attempts. Jameis Winston has the highest mark in the NFL, at 8.78 percent. No shock here, as the best go-ball thrower in the league also leads the league in yards (906), completions (28), touchdowns (10) and big-time throws (20) on passes targeted at least 20 yards downfield. Showing great touch to hit throws outside the numbers, Watson has completed 40 of his 49 out-route concepts for 542 yards while maintaining a healthy average of 11.1 yards per attempt. Newton’s big frame has helped him on slant routes over the middle of the field, as he has completed 14 of 20 passes despite being subjected to three drops. Newton also finds himself in second with two slant-route touchdowns this season. Goff has completed 27 of 35 in-route concepts this season for 440 yards and an average of 12.6 yards per attempt, both of which lead the league. Rodgers leads the league with a 126.9 passer rating on hitch concepts, completing 29 passes for 346 yards and two touchdowns. He does a lot of the work himself on such routes, seeing 71.7 percent of his total passing yards come through the air — as opposed to after the catch — as he throws his receivers open better than any other quarterback on hitches. This is not very often used, with just 87 attempts leaguewide, but Mayfield’s lone incompletion on a comeback was credited as a drop, and so he sports a 100 percent adjusted completion on such throws. While Jared Goff leads the league with 16 completions on post routes, Rivers leads all quarterbacks with four touchdowns. He sports a whopping 30.1 average depth of target on posts, good for second highest in the league. With his prowess on deep passes on full display this season, Goff is 6-of-9 on corner routes, throwing for 158 yards and six big-time throws, two more than the next quarterback. Mahomes averages 18.4 yards per go route, completing 12 of 19 for 349 yards and five touchdowns. 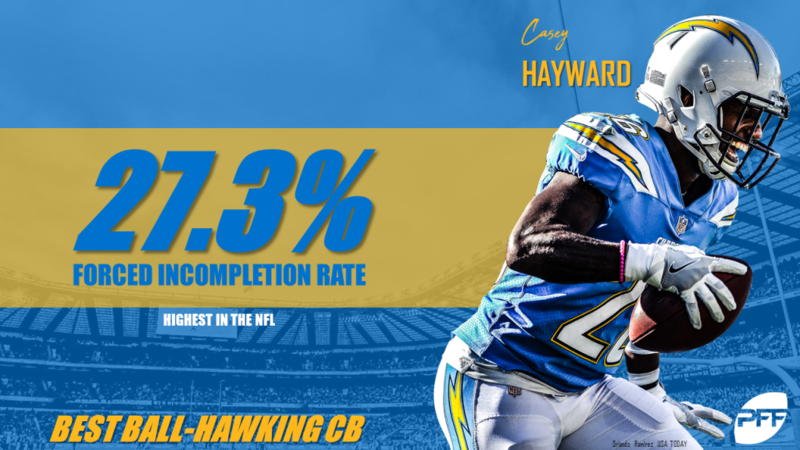 Although his average depth of target is on the low end of the spectrum, he has found his playmakers with space, as 24.5 percent of his go-ball yards come after the catch. It’s the added bonus of having Tyreek Hill and some of the fastest receivers in the league. Rodgers can buy time with the best of them and has completed 20 crossing patterns for 380 yards this season. His ability to see the field is on display when looking at his numbers on crossers. He sports the best big-time throw-to-turnover-worthy-throw ratio at 5-0 on those routes this season. Inside the opponent’s 20-yard line, Thomas leads the league in grade (88.2), receptions (17), yards (128) and combined touchdowns and first downs (12). He isn’t thought of as a slot receiver, but when Green lines up inside, he has racked up the highest grade (94.0) among the 99 NFL receivers with at least 35 snaps from the slot. Green has hauled in 20 receptions for 361 yards and four touchdowns from the slot this season, as 17 of his receptions have moved the chains or scored a touchdown. Among receivers with at least 10 deep targets (20-plus yards), Thielen sees the highest passer rating when targeted (156.3). Honorable mention goes to Tyler Lockett of the Seahawks, who leads the NFL in deep-ball touchdowns with six. Seemingly simplifying the offense for a rookie quarterback in Sam Darnold, no receiver comes close to Enunwa’s screen-game numbers: His 137 yards, 160 yards after the catch, seven first downs and six missed tackles forced are all first in the league by some margin. Fifteen of Thielen’s 19 out-route receptions have resulted in first downs (leading the league). He consistently moves the chains and averages 3.6 yards after the catch on outs. Hopkins leads the league with 15 receptions, 190 yards and a 95.9 grade when targeted on slant routes. He’s tied with Odell Beckham Jr. with 10 combined first downs and touchdowns on slant routes. All eight of Woods’ receptions on in routes have resulted in first downs, tying for the NFL lead. He averages 19.6 yards per attempt, the best figure among NFL receivers with at least 10 targets on designed in routes. With 13 targets, 11 receptions, 167 yards and two touchdowns, Adams sees a perfect passer rating of 158.3 when targeted on hitch concepts this season. Jackson averages a 37.5-yard depth of target on post routes, leading the NFL with three touchdowns and 55 yards after the catch. Cooks has found a home in Los Angeles, as quarterback Jared Goff sees a perfect passer rating when targeting Cooks on corner routes: 4-of-4, 103 yards and two touchdowns. No matter which quarterback is at the helm, be it Jameis Winston or Ryan Fitzpatrick, Evans has 130 yards more than the next closest receiver on go routes (282 in all). 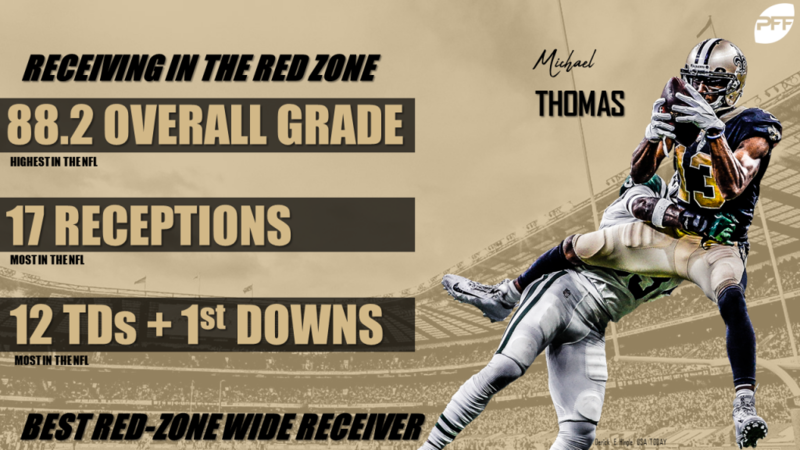 Brees is on a record pace with his completion percentage when targeting the former Ohio State standout, and Thomas’ 95.0 completion percentage on crossers is first in the league among receivers with at least 10 targeted passes. While Todd Gurley II has 621 yards after contact through 10 weeks, Hunt has forced 41 missed tackles, eight more than the next running back and 19 more than Gurley. Hunt also led the league after Week 10 with 42 in 2017. Four running backs have been targeted at least 60 times this season (Christian McCaffrey, Saquon Barkley, James White and Kamara), and Kamara leads them all in yards per route run (2.24), average yards per reception (8.6) and passer rating when targeted (111.7). Gordon leads all running backs with seven missed tackles forced inside the opponent’s 20-yard line, as he has gained 100 yards on 18 red zone carries. He has picked up 64 of those yards after contact and averages a league-best 5.6 yards per carry in the red zone. Of the 49 tight ends with at least 100 run-blocking snaps, Doyle’s 83.2 run-blocking grade is 5.0 grade points clear of the next best. A high finisher in PFF’s pass-blocking grades for years, Bakhtiari hasn’t dipped below an 85.0 pass-blocking grade since his rookie season. In 2018, his 93.5 is 3.0 grade points higher than the next tackle and a clear 2.5 points higher than the next qualified offensive lineman at any position. McGlinchey is dominating action for the 49ers’ rushing attack, as the rookie from Notre Dame paces the NFL with an 82.9 run-blocking grade, tops among any offensive lineman regardless of position. Blythe and Havenstein share honors here, as the Rams’ offensive line has been dominant all season. Neither has been penalized across 672 total offensive snaps, most in the league without a penalty. Holding the best grade among all defensive players, Donald remains in a class of his own, with a 94.7 overall grade through 10 weeks. His 67 total pressures are the most among any position on defense, and his 12.5 sacks lead the league. Displaying a nose for the football, Wagner finds himself around the ball more often than not. On 69 tackle attempts this season, he has yet to miss one. Hughes has won 23.4 percent of his pass-rush snaps this season, getting home with a pressure on 20.5 percent of his total snaps. Both figures lead the league’s edge defenders. No one rushes the passer better from the defensive interior than Donald. 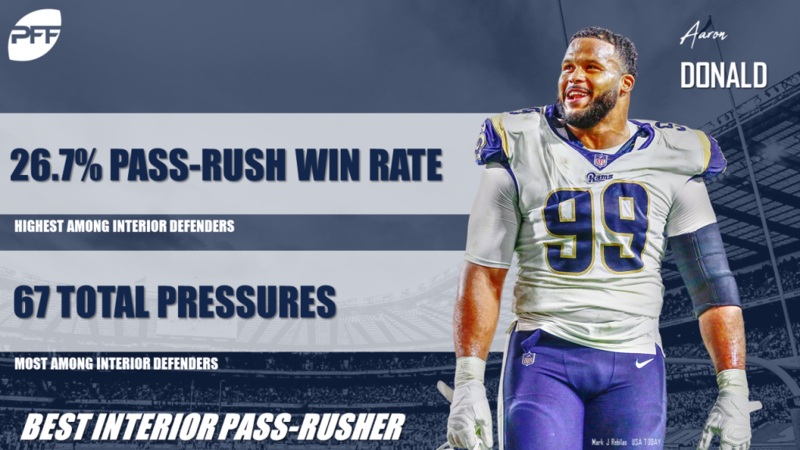 He has won 26.7 percent of his pass-rush snaps, gets home with a pressure on 20.1 percent of those snaps and has recorded 67 total pressures — all leading the league’s interior defensive linemen. No matter which team he suits up for, Harrison has been a menace to opposing rushing attacks. He has made 12 tackles for either no gain or a loss against the run, four more than the next interior defensive lineman. Donald is already nearly impossible to engage cleanly at his size, but when you add his quickness and ability to make himself skinny with a swim move, offensive linemen are left grasping at air. Cox is a 310-pound defensive tackle who ran a faster 40-yard dash at the combine than Dallas Cowboys linebacker Sean Lee. Cox uses that explosiveness to run through guards on an almost at-will basis. Wagner makes a tackle in run defense just 2.96 yards past the line of scrimmage on average, and he has made six tackles for no gain or a loss against the run this season. Hayward might not have an interception this season, but he has forced nine incompletions on 33 targets, giving him a league-leading 27.3 forced incompletion percentage. Spending 247 snaps in coverage from the slot, King has seen the most targets in the NFL there (35) without a touchdown allowed. In run defense, no safety has made more stops (19) or stopped rushers more frequently (8.9 percent) than Adams when lined up within 8 yards of the line of scrimmage. Bates impressed enough through camp and the preseason that the Bengals let George Iloka go in favor of the rookie out of Wake Forest. He has paid it back to Cincinnati by allowing just 0.17 yards per snap when he is in coverage, the second-best mark in the league. Robey-Coleman is one of three defensive backs to have forced an incompletion on a screen pass this season and is limiting receivers to 4.2 yards per screen-pass target. Callahan has shown great instincts on out routes this season, jumping two of them for interceptions to lead the league. Rhodes has been targeted three times on slant routes, all to no avail. He has intercepted one and broken up another, seeing a 0.0 passer rating when targeted on slants. All three of Swearinger’s in-route targets have been intercepted (two) or broken up (one), and he leads the league in grade in that area. Targeted seven times on hitch concepts, King has intercepted two and forced another two incompletions, leading the way to a 19.0 passer rating when targeted on hitches. Similarly to those mentioned above him, Howard has intercepted two passes on post routes, compared to just one completion allowed (5.8 passer rating when targeted on posts). James’ ability to read the play in front of him has been apparent this season, never more than when he’s targeted as the primary coverage defender on corner routes. He has not allowed a reception on three targets, and he has an interception and another forced incompletion to his name. Six targets, zero receptions allowed. King sports a 0.0 passer rating on go route targets this season, and he also has forced two incompletions. The rookie out of Louisville has forced three incompletions on crossers compared to just two receptions for a mere 13 yards. In coffin-corner situations (line of scrimmage at their own 41-yard line or further), Koch has drilled 18 of his 20 punts inside the opponent’s 20-yard line and averages 38.8 net yards per punt, good for third in each category among punters. While Denver is known for its thin air, a dream for any kicker, McManus has shown great restraint when it comes to kickoffs, producing a touchback on only 26 of 45 kickoffs for an average distance of 64.9 yards — right to the goal line. These short kicks have produced an average starting field position of the 22.6-yard line, 2.4 yards short of the touchback that many teams simply concede with each change of possession. Tucker has the most 50-plus-yard field goals this season without a miss, connecting on all four of his attempts from beyond 50 yards.